I'll admit here and now, although I am an absolute superfood fanatic, this is the first time I have ever tried Chia Seeds. I know, I'm a bit behind on the times in this case aren't I?! 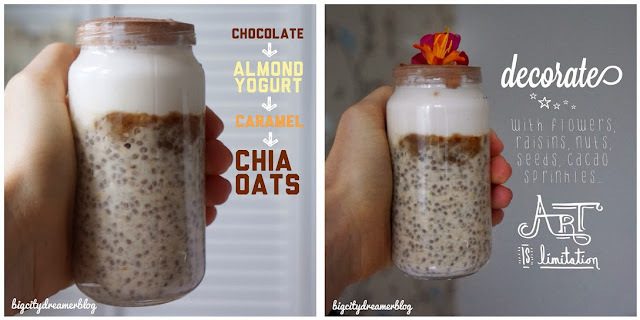 Although chia seeds, like other seeds, make a lovely crunchy (but usually tasteless) topping to porridge and smoothies, they can completely transform and add a whole new dimension to your food when soaked overnight..I present to you Chia Pudding. Chia Seeds are great for regulating blood sugar levels. The coating of the seeds (achieved by soaking) can slow down digestion and prevent blood sugar spikes, both good factors for fighting diabetes. Chia Seeds are extremely high in Omega 3 healthy fatty acids for brain health; fibre (11g in a 1 oz serving) for digestive health; calcium (18% RDA in a 1 oz serving) for bone and teeth health; and protein (10% RDA in a 1 oz serving) for healthy hair, nails and muscles! That's a whole lot of goodness in one little seed! As well as the nutrients mentioned above, Chia Seeds are also high in phosphorus and manganese, they keep you fuller for longer (thanks to a certain amino acid that they provide) and can improve heart health by lowering bad cholesterol and blood pressure. Anyway, on with the recipe (which I posted on instagram about a month ago...I'm kind of behind with my posts)! Make the healthy Caramel Date Sauce and add to parfait. 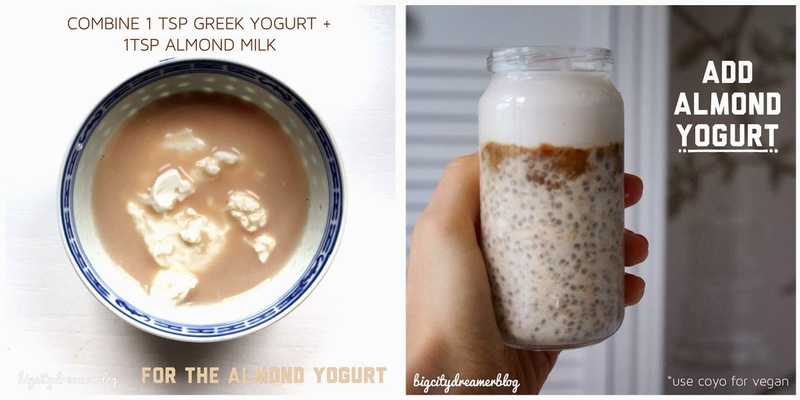 Make the Almond Yogurt by combining almond milk and greek yogurt *use coyo or soy yogurt for vegan. Make Chocolate Milk by combining almond milk and cacao powder; add to parfait. For the base, combine 1/4 cup oats, 8g chia seeds, 1/4 cup unsw almond milk, 1tsp apple sauce (can be altered to anything to add sweetness) and 2tbsp water. Stir, cover and leave in fridge overnight. Simply microwave 2 pitted dates, 1tsp water, 1/8 tsp salt and 1/8 tsp cinnamon for 40 secs. Mash, adding more water if needed, until a smooth caramel consistency is achieved. 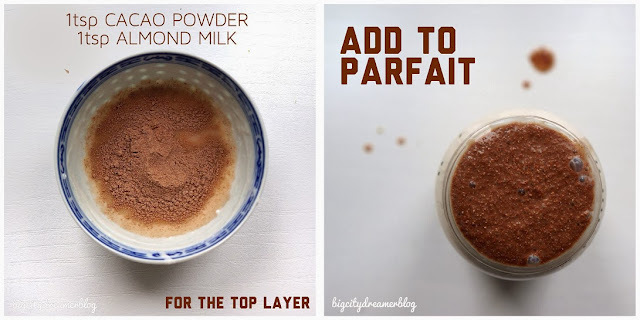 Combine 1/2tsp cacao powder + 1tsp almond milk. Layer up and top with raisins, seeds, nuts, dates, cacao nibs or anything your heart desires! Have you tried Chia Seeds? What are your favourite Parfait toppings?! Ooooh this is just gorgeous, its my breakfast tomorrow morning! Thank you so much for your beautiful recipes they are simply divine! The step by step guide is so useful..i'll try this for sure, thank you! Looks so yum! Thank you for sharing the recipe!